Synthetic EPDM rubber athletics tracks are becoming more and more popular in schools, clubs, leisure centres and other organisations across the UK. The growth of athletics as a sport has lead to more people taking part in a whole host of events which therefore means there is a higher demand for top quality athletics tracks and facilities to be built by experienced and reliable contractors. Please speak to our team if you would like to find out more about these facilities and how they can be built. The designs and specifications vary for each project but we’ll be able to work around your budget and requirements. So what are the standard sizes and dimensions of athletics running tracks? Well, an average 400m running track installed in a school, athletics club or leisure centre etc. generally has 8 lanes, each with a minimum width from 1.22m up to a maximum width of 1.25m. However the dimensions of these athletics tracks can vary depending on individual specifications and designs, we can tailor your running track to whatever requirements you may have. Each athletics sports facility can be constructed to suit and be used for a number of different events, including 25-100m sprints, long distance races, 4x100m relays and hurdles events. 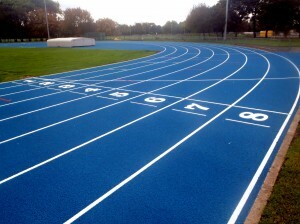 All athletics running tracks should be appropriately line marked with weather resistant paint to ensure that the staggered starting lines are marked accurately and therefore all competitors in a race will run the same distance. Our team can also install surfacing for other athletic sports including long jump, triple jump, pole vault and javelin so you can transform your school, college or leisure centre into a great all round athletics facility. If you’re interested in having a running track installed for your school or club facility, please speak to one of our experts for a price. All you need to do is fill in our contact form and we’ll get back to you with all the information you need, as well as discussing a quote to suit your budget. Quite a lot of sports clubs in addition to academic institutions have started to get more affordable features installed for sports and athletics. A lot of academic institutions are unable to get sport features remodeled, meaning that children miss out on sports chances. This is generally a result of a lack of budget or not a sufficient amount of external space for the school to install on. In numerous organisations, compact sports facilities are now being developed and installed in smaller sized dimensions to fit constrained budgets and to be more cost effective. The dimensions of athletics running tracks can be completely customised to suit each project and the levels of participation required. FUNdamental skills can also be developed by using these compact sports activities, since youngsters can improve their running, throwing and also jumping. By installing various athletic features, kids are capable of getting involved with a variety of activities for a far more varied experience. Running tracks, jumping run ups and even discus circles are just some of the more preferred activities that could be installed. Multiple activity areas can be created by installing a single track; this can be utilised for long jump, relay races, hurdles and many more. In schools that can’t have a full sized running track, this will make a fantastic alternative that’s more affordable and also occupies significantly less room. As the young people could then take part in numerous events, they could find a certain one that they enjoy and would like to carry on at a qualified athletics club. One particular problem that’s impacting young children’s engagement in athletics is a lack of facilities which are targeted at beginners in addition to beginners level sports athletes. It is important for little ones to take part in athletics from a young age – KS1 and KS2 – and carry on through KS3 and KS4. A brand new set of criteria has been created by UKA to be certain that sports and athletics features are more widely available to young children. The scheme presents schools with more compact, recreational quality facilities which can be designed with a vibrantly coloured, appealing look for young children. For establishments with a low spending budget along with external space, the compact sports and athletics facilities make a perfect solution for teaching simple FUNdamental skills in a range of sports activities. Throwing circles, jogging straights along with jumping runways are amongst a few of the popular components of these recreational surface types. We are able to modify dimensions and sizes of each installation to fit the space on site. Compact athletics facilities are flexible, which allows them to be utilized for a variety of establishments. Colleges, universities, primary schools and also high schools can set up these to enhance existing sports activity and play provision. By taking part in diverse sports and athletics activities, young children from Key Stage One – Key Stage Four all can build up leaning and also physical fitness skills. A primary reason you have to improve your athletics facility would be to encourage young children to participate in these kinds of sporting activities. For any school hoping to keep costs down and stick within a budget, the compact recreational facilities provide an excellent solution. If you would like the younger people at your organisation to develop physical education skills, it is recommended that you have a smaller sized facility installed as FUNdamentals are introduced. UKA wants to enhance interest in athletics and bringing out available facilities for youngsters is a huge step to this goal. Considering the IAAF and IPC World Championships are being held in London in 2017, it’s likely that more young people will become involved. The strategic placement for new facilities is going to be crucial in catching this need and providing feeder pathways into sporting activity at club venues. As experienced specialists in the installation of artificial athletics tracks, we offer excellent service and a top quality end product on every project we carry out. We are experts in a vast range of sports and play surfacing products including artificial grass and polymeric tennis courts as well as athletics and running track facilities. We can also offer you financial help with your sports or play surfacing project through a funding grant, please visit the funding grants website to find out if you’re eligible. 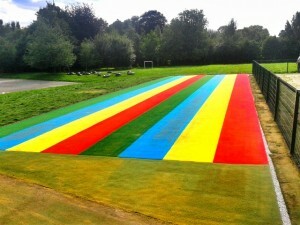 If you would like any further information about our huge array of services please visit our website https://www.sportsandsafetysurfaces.co.uk/ where you can find examples and case studies of our previous work to help you with what you are looking for. To submit an enquiry, receive a quote for a project, or learn more about what we can do for you, please complete the contact form and we will be able to help you with any requirements you have. If you thought this article was helpful, please share it and leave a comment! « What is Athletics Running Track Surfacing Made From?